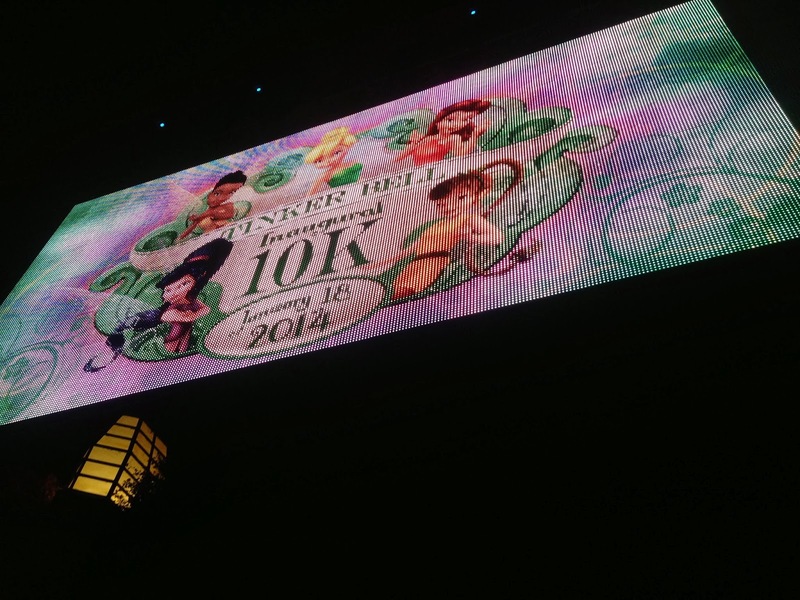 This morning was the Inaugural Tinker Bell 10K at the Disneyland Resort. 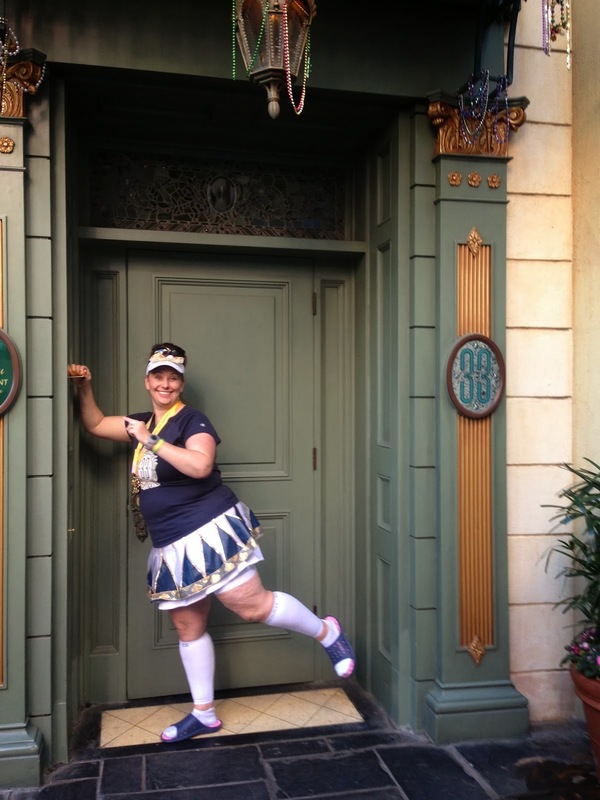 Spoiler Alert: I think the 10K today may have bumped the Tink Half Marathon from my #1 runDisney spot! It was simply perfection. 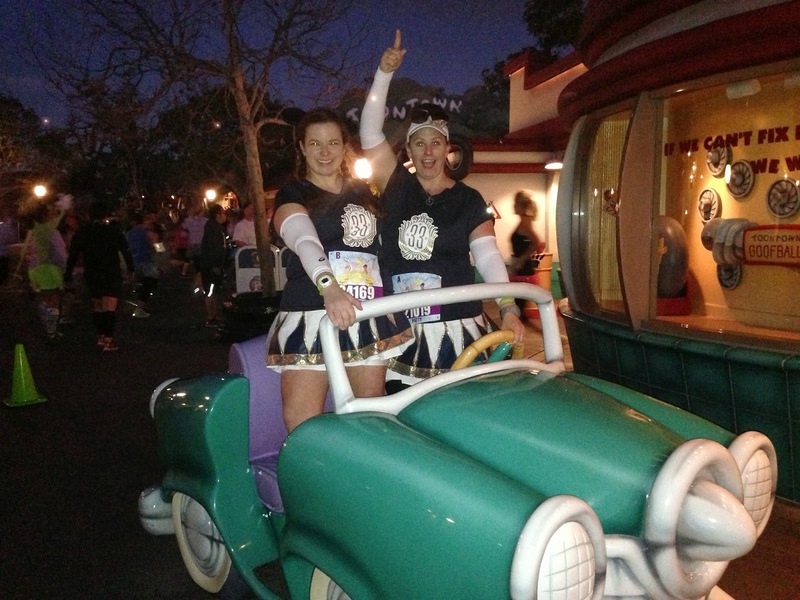 runDisney put on a wonderful race. The morning started out with that early wake up call and meet up with my fellow running pals. First up was the Club 33 China Plate group. April, Yanni, Sarah and I loved this concept and loved the reality even more! 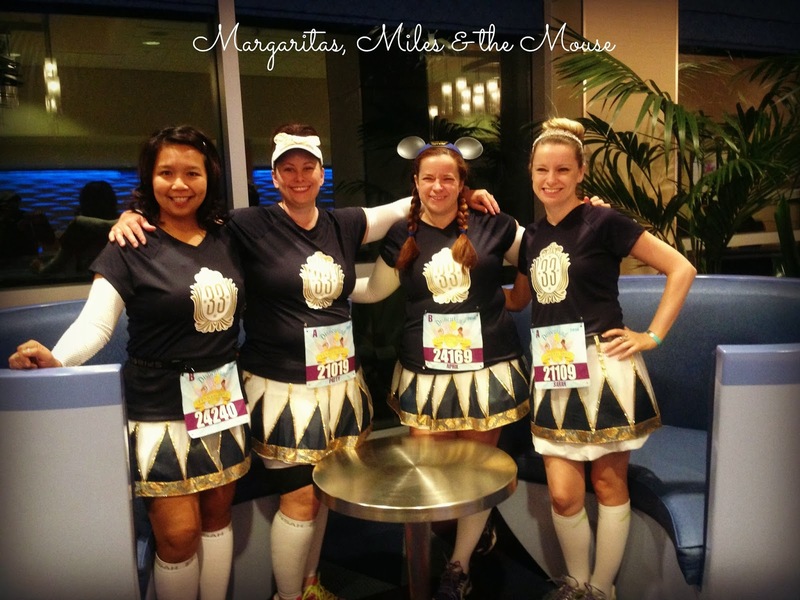 We had so many people stop us on the course or give us shout outs over these costumes! A home run, for sure! 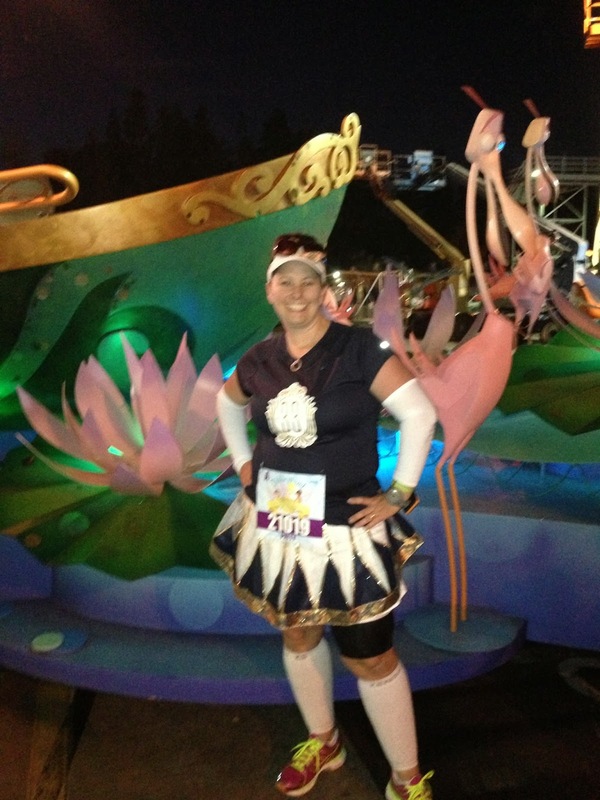 For those that asked, the costumes consist of a White Linen Sparkle Skirt with a custom overlay made by Vicky Runs. Her Etsy Shop can be found here. The shirts were Champion brand and the vinyl was made by Miranda Connelly. Her Etsy Shop can be found here. We are thrilled that everyone loved them and hope you feel free to order your own from SparkleSkirts, Vicky & Miranda! April and I decided to stick together today for most of the race. It was all about pictures you know! Tomorrow the real work happens #WhompWhomp but today was all about the fun! 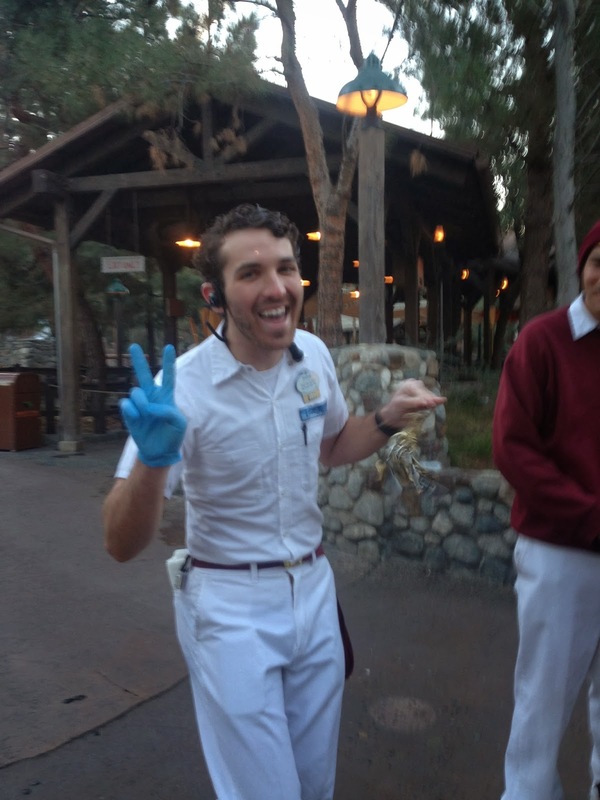 We started the race off with the usual fanfare from Rudy and Carissa and heading right into Disneyland. The back stage was our first stop. There we saw some great floats and smelled some goats. Fun, but we were dying to head into the park where we would see some of the characters! Well, dying to see characters was pretty apt. After passing on some chipmunks (I think) in Toon Town, we found a queqe for the Haunted Mansion. Yes. They had characters out. You could hear people putting on the hard stop to back up and get in line. And what a line it was! So worth it! I have never seen these characters on a race course (or anywhere else in the parks!) We were all thrilled when we saw them. I’m not sure I ever calmed down after this. Truly- I was not feeling the whole “running” thing this morning. I was in a funk and in a mood. But this— yeah, this turned the whole morning around! I was also THRILLED when I heard my name called and saw my cousin Janice running up to me! 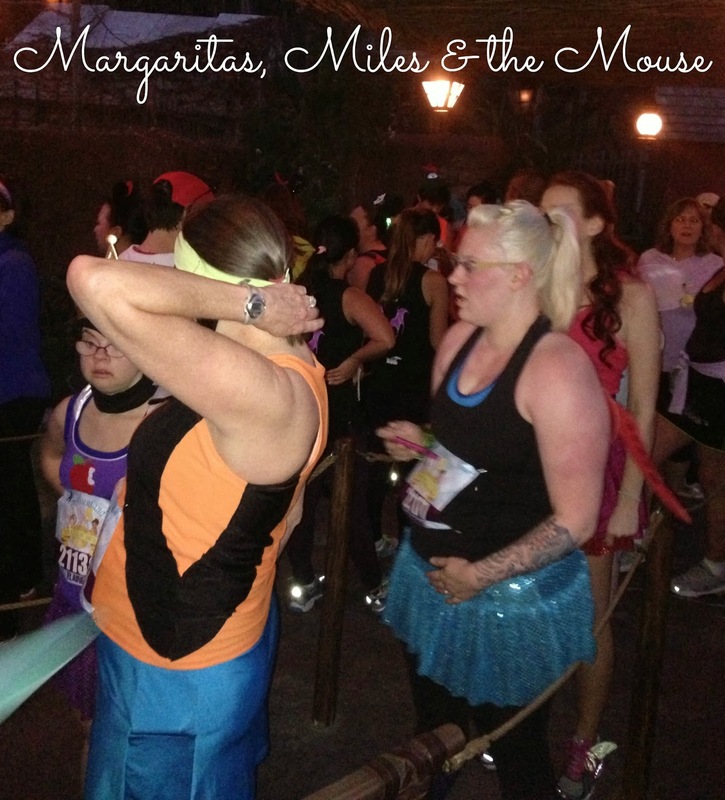 This was Janice’s first 10K and her first runDisney event. Annnndddd… she’s hooked. 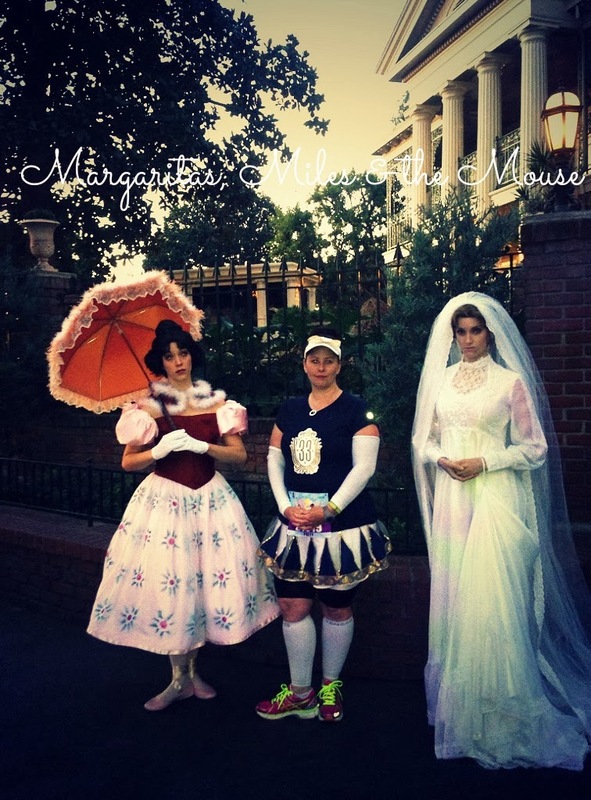 I hear she will be running again for Autism Speaks at the Disneyland Half! Way to go Janice! About this time Amy and April found us. DisBroads reunited! We ran about half the race together after this until April heard “You are 4 minutes above pace” and decided that was way too close for comfort! She and Amy finished about 14 minutes ahead of me and made up some time. 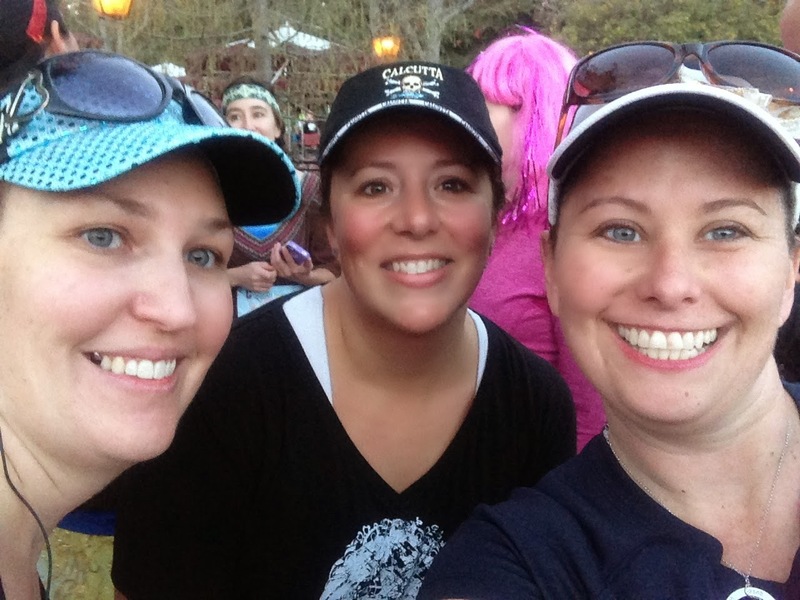 We also ran into Summer and our friend Kirsten on the course around the Mary Poppins line. 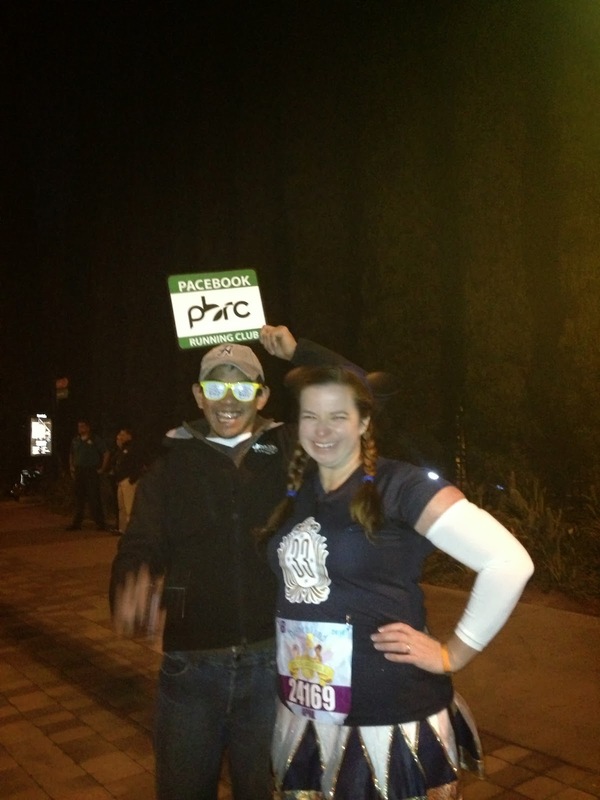 The Arizona PbRC crew was also running around our same pace. I loved chatting with my new BRF and really can’t wait to get settled in Arizona to be with them more often! The power of the internet: you have running friends everywhere! While there were tons of my friends on the course, there was also some special ones missing. Our DisBroads were not complete! 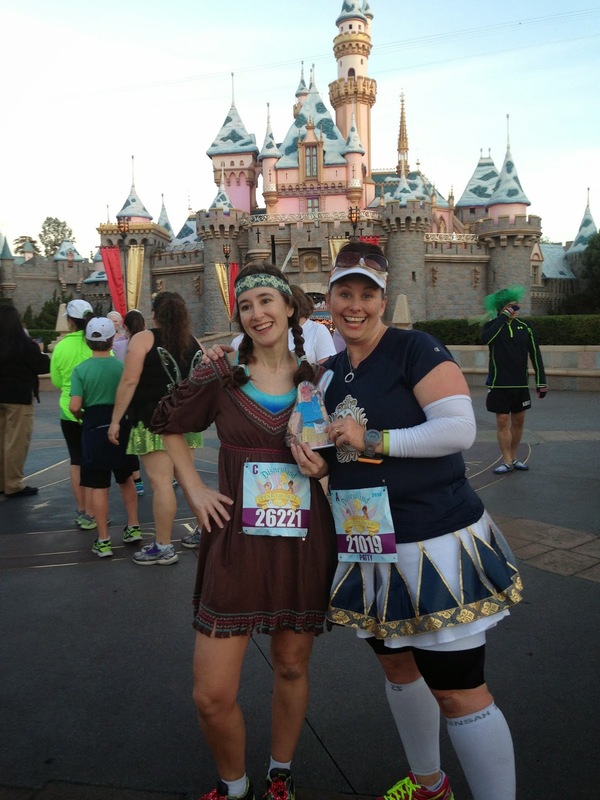 Amy and I had to take a shot in front of the castle with Flat DisBroad Julie, our fellow Princess Half Marathon running pal. Soon it was time to exit the park and head into Disney California Adventure. This part of the park seemed to be short on characters. Or maybe we just ended up short on time, so we blew past a few characters. At one point we did indeed see the sweeper man with the flag letting us know that we were currently 4 minutes ahead of pace. Only 4 minutes?! Wowza. Time to get moving. This CM had the best “cowbell”- his HUGE keyring! Finally we exited the parks. We passed by Mater and Lightening McQueen as well as the Monsters Inc crew. We were feeling the time crunch and knew it was time to get a move on! One on the open road we heard one more update- we had fallen to 2 minutes ahead of pace. At this point, I sent April (a faster runner than me) on her way, plugged in my headphones, set my Gym Boss intervals, and went to work. I’m happy to report that the next updates stated I was 3 minutes and 4 minutes ahead of the sweeper pace, so I was able to make up some time. 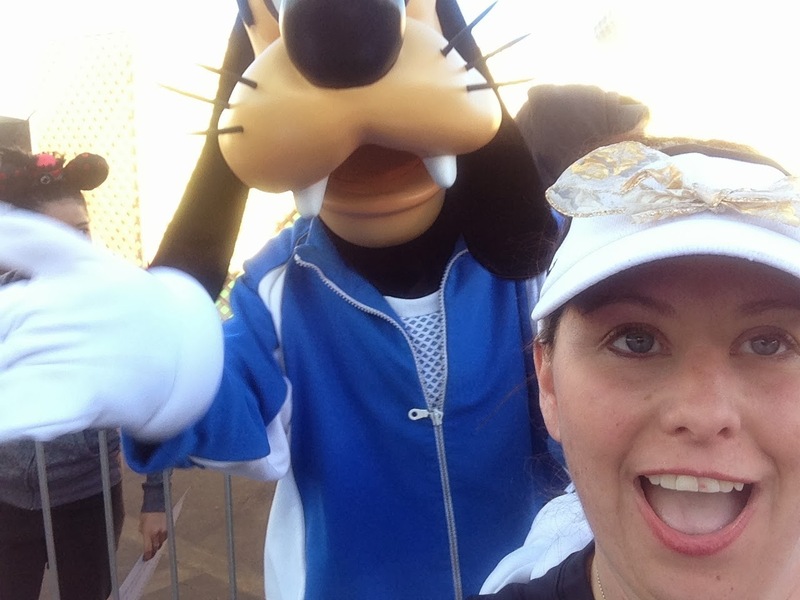 The finish line was near and I grabbed a quick selfie with Goofy. 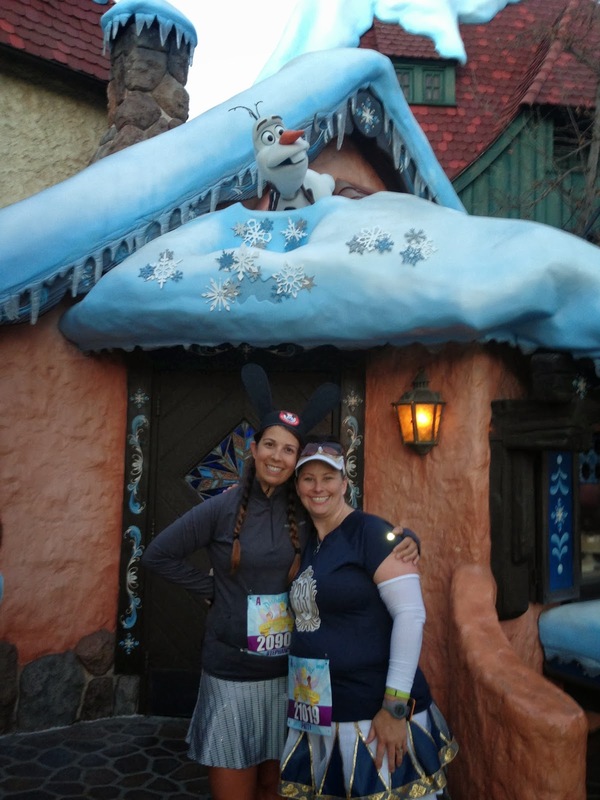 I don’t know why, but the Disneyland races do not allow you to stop and take pictures with the finish line characters like the Walt Disney World races do. But you know me… I took one anyway. 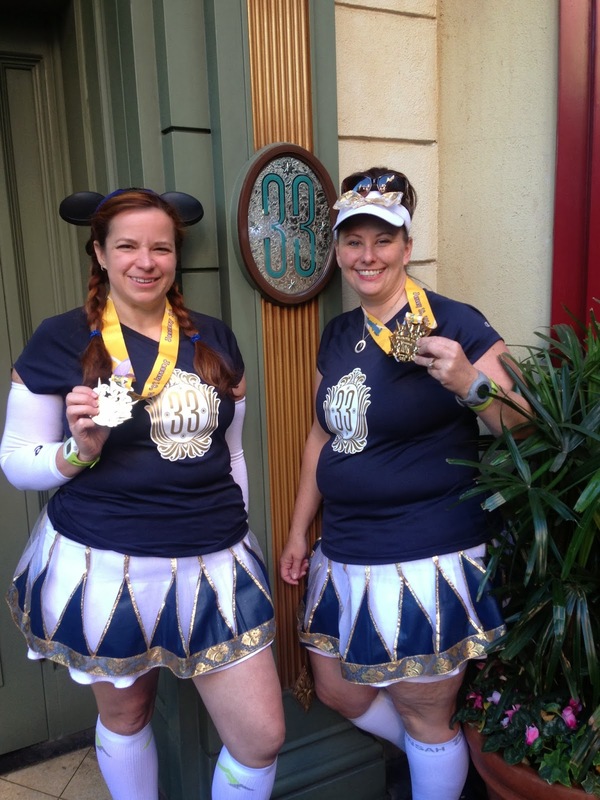 After I got my bling and my water, April and I knew we had one more stop to make before we called it a day. 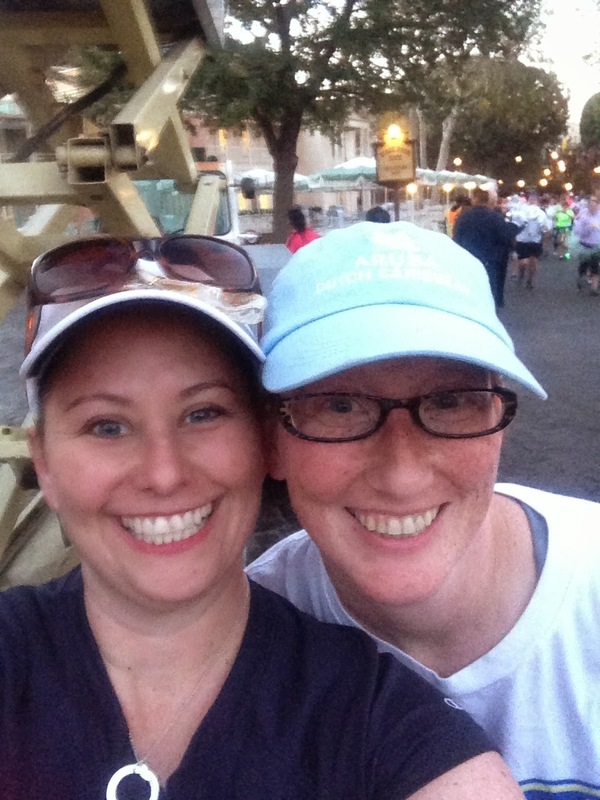 We headed into Disneyland Park and took the train to the New Orleans Square. It had to be done. Yes, those are my PR Sole Sandals from Gone for a Run! I loved this race. 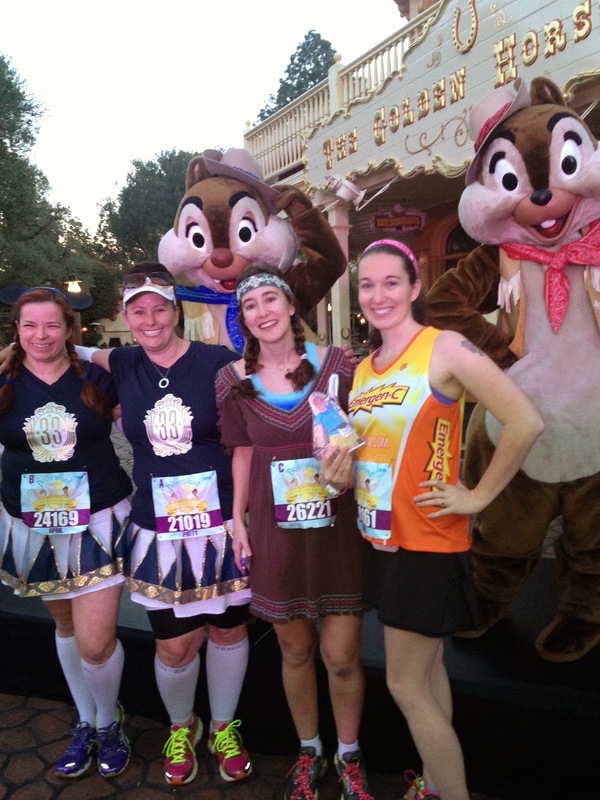 It had new characters and a different course than the Disneyland 10K. At first I thought I’d hate running on the streets at the end of the race, but today turned out to be just perfect for me! The weather, the friends, the costume, the bling, the photos… I simply loved it. Oh, and Inaugural was spelled right too. 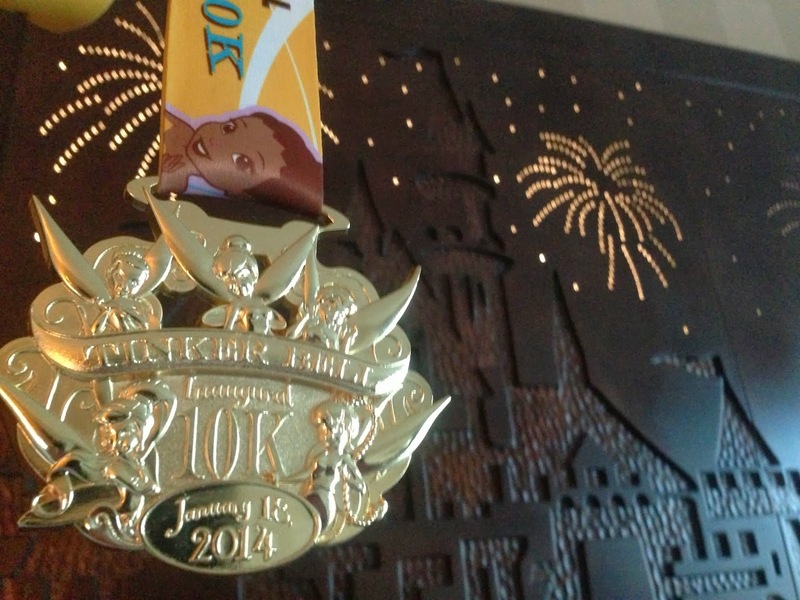 Did you run the Tinker Bell 10K today? What did you think about the race?